The Belmont Park fall meet is called the “Championship Meet” for a good reason: It features the most “Win & You’re In” qualifiers for the Breeders’ Cup than any other fall meet, in addition to a variety of stakes races throughout every division in thoroughbred racing. In addition to stakes races, this meet also offers top-notch racing and wagering on all types of races daily. Belmont Park’s fall meet will feature 44 stakes races, including 19 graded stakes, of which seven are Grade 1 races. All seven of those Grade 1 races are Breeders’ Cup Challenge “Win & You’re In” races, which offer automatic berths into the Breeders’ Cup championships. Other stakes races being run as Breeders’ Cup prep races include the $300,000 Gallant Bloom Handicap (G2) (Filly & Mare Sprint), the $200,000 Pilgrim (G3) (Juvenile Turf), the $300,000 Kelso Handicap (G2) (Dirt Mile), the $200,000 Miss Grillo (G2) (Juvenile Fillies Turf), and the $500,000 Hill Prince (G3) for 3-year-old turfers. The Belmont Futurity (G3) on Oct. 7 and the Matron (G3) on Oct. 8 will also serve as preps for the new Breeders’ Cup Juvenile Turf Sprint (G1); the $150,000 Belmont Turf Invitational will be a prep for the Breeders’ Cup Turf Sprint (G1). The Belmont Park fall meet also shines a light on New York-breds with one of the country’s best state-bred race days with their annual “New York Showcase Day”, when the top New York-breds gather to complete in eight stakes worth $1.75 million, highlighted by the featured Empire Classic. Every meet, no matter where or when it is, is always more enjoyable for horseplayers when you are winning and cashing tickets. For this reason, it pays to know and understand the track dynamics and handicapping trends, as Belmont Park’s main track, also known as “Big Sandy,” is a dramatically different surface than the dirt track at Saratoga or Aqueduct. Belmont runs almost exclusively one-turn races on dirt at distances ranging from 5 furlongs to 9 furlongs. Belmont rarely writes 1 ¼-mile and 1 ½-mile dirt races (except the Belmont Stakes, of course); therefore, a horse’s two-turn record is not as important as its one-turn record for the purposes of evaluating Belmont’s main track route races. On Belmont’s main track, speed is an extremely handy commodity. Other tracks, such as Saratoga, Monmouth, and Pimlico, have more of a reputation as being speed-biased tracks, but Belmont Park has also been known to favor early speed. Sure, late runners will have every opportunity to close at Belmont with its wide, sweeping turns and long stretch, but Belmont Park’s winning track profile always seems to put a premium on early speed and is known for daily track biases that only strengthen the advantage of speed and pace-pressing horses. On the Belmont main track, always assume the prevailing main track bias will favor speed horses, and horses able to stay within 2 1/2 lengths of the early pace in sprints, and within 4 lengths of the early pace in routes. When it comes to post position angles on the Belmont main track, the track does not always play like you would expect. The fact that Belmont runs almost no two-turn races due to its 1 1/2-mile layout nearly negates any inside bias the track might have in route races (all route races up to 1 1/8 miles are around one turn), and there is little to no advantage to be gained by “saving ground” on the main track. Six furlong races and most sprint races are most likely to favor inside posts at Belmont, with a slight preference to inside posts also at 6 1/2 furlongs. However, that advantage disappears at 7 furlongs, and actually begins to reverse at 1 mile, 1 1/16th miles, 1 1/8 miles. In these races, the inside posts offer no advantage at all, with some horses actually perhaps at a disadvantage unless they have early speed and can charge out to the front and get off the rail. In general, it is usually a good idea to upgrade outside posts in main track races at a mile or more, especially if the horse in question is an overlay. Of course, nothing beats a good, old “horse-for-course” when handicapping Belmont dirt races. Certain horses love the Belmont dirt surface and others cannot do their best running there. Part of this preference for the local oval has to do with the track layout as well, with Belmont’s wide, sweeping turns helping some horses and hurting others. This angle is always a big handicapping positive, but it seems even more potent as a betting angle at Belmont Park. At one mile on the Widener turf course, posts 8-12 should be expected to win for about a combined 5 percent at a mile, while posts 9-12 should win about 6 percent at 1 1/16-miles. On the inner turf course at 1 1/16-miles, horses from posts 8 and outward also can be expected to win only about 5 percent at a time. At 1 1/8-miles, posts 8 and out may win only about 7 percent. Downgrade horses drawn in posts 8-12 at a mile on the Widener turf course, and downgrade horses drawn 9-12 at 1 1/16 miles on the Widener. On the inner turf course, downgrade horses from posts 8 and outward in races at 1 1/16 miles and 1 1/8 miles. Weather has a big impact on Belmont turf racing in the fall. For the first half of the Belmont fall meet, temperatures can still be quite hot at times, and the courses can really get baked firm by a lack of rain. 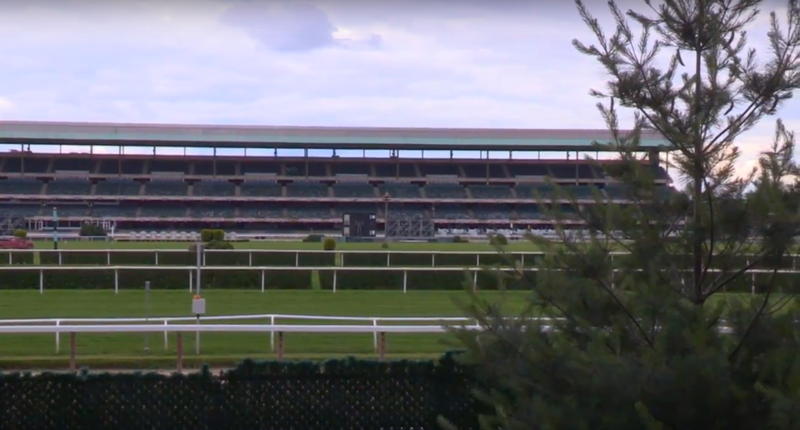 During the latter portions of the Belmont fall meet into October, however, things begin to soften up as the area is often affected by raw, fall showers that keep the courses a bit moist, even under “firm” conditions. Belmont “firm” turf in September is far different from Belmont “firm” turf for the second half of the fall meet after the Breeders’ Cup Preview, when cooler temperatures, wetter conditions, and heavy use usually begin to take their toll on the turf courses by softening them up. Because of these turf conditions, handicappers should upgrade turf front-runners during the first half of the meet when the courses are firmer, and then begin to downgrade those horses in favor of closers during the second-half of the meet. Most grass horses will make more than one turf start at the Belmont fall meet. Many will make three starts, and some will even make four turf starts. The Belmont fall meet will be filled with turf overlays and underlays during the second half of the meet after horses have already made their first race of the fall season, because they will be bet in their latter races based too heavily on how they finished in their earlier races. The problem with that is differing turf conditions later in the meet mean that horses rarely run the same way in their subsequent turf starts later in the meet. Horses that ran well early in the meet often don’t run nearly as good later in the meet, and horses that ran badly early in the meet often don’t run nearly as lousy later in the meet. This angle is a particularly effective moneymaker when you see front-running horses that benefited from the course conditions early in the meet that you can downgrade as likely underlays during the second-half of the meet when the turf plays much less kind to speed. At the same time, you can also catch overlay prices on live turf closers and stalkers who tend to win more often later in the meet, even if they flopped earlier in the meet. As a side note, when it rains, the inner turf typically dries out faster than the outer course, so always try to keep that in mind when evaluating horses that prefer good, yielding, or soft turf. Turf sprints at Belmont Park are a whole different ballgame, and those races will be a focus in my next blog installment.